Quadsys Limited are a leading supplier of security software, anti-virus products, hardware, infrastructure and their associated services. Offering a comprehensive range of IT security and Infrastructure solutions. We are ideally situated to deliver our value added services over the entire UK and beyond. 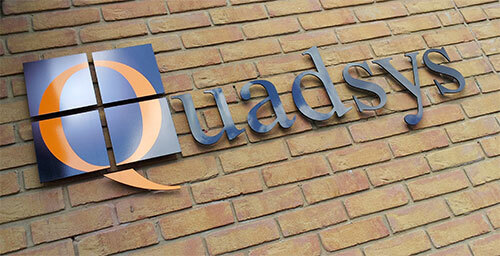 Quadsys highly trained employees have over 30 years of experience within the industry and our clients range from small enterprises to public sector and large multi-national organisations across the UK and Europe. Quadsys deal with only Top Tier Vendors & Manufacturers within the industry, from the core selling of Hardware & Software Licenses, to the design, implementation and documentation of SMB to large scale projects involving Cisco, Citrix, DELL, HP, IBM, Kaspersky, Lenovo, McAfee, Microsoft, Ruckus, Symantec, VMware, and many more. Networks are the backbone of any business. Failure can be highly disruptive to daily operations and therefore to profitability. We work with a number of top tier Hardware vendors like Cisco, DELL, HP, and Lenovo etc... to bring you an array of products to maximise efficiency on the network; servers to laptops, racks to desktops, for a more productive organisation. Quadsys can provide competitive pricing and offer installation and consultancy services on all of our offerings. Our competitive edge is our positioning as a strategic ally with our clients. 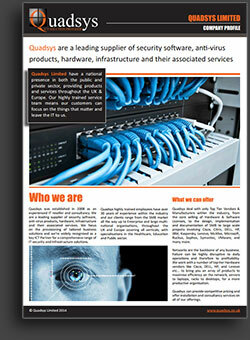 Working closely with our vendor, Quadsys will find the right solution, unbiased and completely flexible. Backed up by our highly skilled technical department, our customers can benefit from our intensely trained consultants to assist them through; consultancy, design, installation and support processes. We hold all the expected and relevant accreditations from the Various Brands that we represent, and the company is strengthened by dedicated Software, Security & Infrastructure teams, all working together. Along with the other accreditations we hold with; Barracuda, Kaspersky, Symantec, etc, this means we have the necessary skillset required to fully secure any network completely and deliver a wide range of projects to our clients.